please feel free to go to the main GEA bookstore and browse for books by other authors. Every life should have the best possible quality and value. The Creator designed us to live a certain way; a way that will serve His purpose for each person. He will give stability and even joy, regardless of circumstances, whether a genius, a pauper, a jock or a victim! God provided a way of thinking and behaving that provides happiness for everyone. All can have this internal value which will give the "success" needed to enjoy life in spite of bad choices, and regardless of the effects from the bad choices of others, and even the pain and suffering that can come from disease, disability or death. 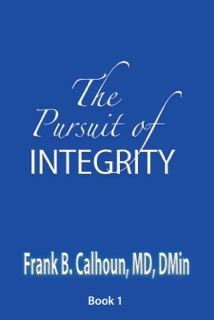 Frank B. Calhoun, MD, DMin, has chosen the word INTEGRITY as the "very best word" to describe all that God created you to be. More than being honest, INTEGRITY encompasses other character qualities that please God. Dr. Calhoun has taken all these into study and chosen the word INTEGRITY to include and express all of them.